I was having a hard time figuring out what to make for dinner tonight, and realized I had some leftover Shredded BBQ Chicken in the freezer that I made a few weeks back. So I decided to try out something new! I hope ya'll can enjoy it too! 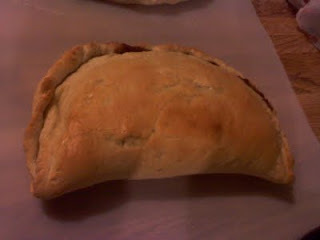 Now the calzones can be made with just some plain cooked chicken breasts too, I just used what I already had on hand. Place Chicken in the Crockpot, pour the bottle of sauce on top, should be enough to coat and have a little extra. Cook on Low for 5-6 hours. Once done shred the chicken with two forks and place it back in the crockpot for another hour or so to soak up more sauce. Serve on rolls, or use to make Calzones. This also freezes beautifully! Once the dough is finished, turn it out on a very lightly floured surface and cut it into 2 even sized pieces. Roll each ball of dough out into a rectangle. Mix Chicken, Sauce and onion in a bowl and spread it evenly on half of each crust. Sprinkle Cheese on top. 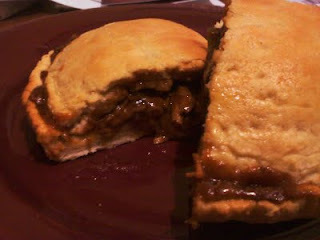 Fold other half of crust over and pinch the ends of the dough together to seal everything in. Place a Pizza Stone in the oven and preheat to 350 Degrees (can also use a cookie sheet). Once heated place the calzones on the stone and bake for 15 minutes or until top is golden brown. Spread a little butter on top while still hot and sprinkle with some Garlic Powder. This was delicious! I know it seems like a lot of work, but it really wasn't. The chicken was in the freezer and was just defrosted for this recipe. We really enjoyed it and I will totally be making this again!